Posted by Ms TooFly at 12:41 | Labels: Watch my feet..
Nike have released plenty of hot colorways exclusive to their ladies’ line- up. A new Nike Dunk High has been released for us ladies. Inspired by the 2008 Beijing Olympics, they feature a full metallic silver construction with the use of an all over octagon print. 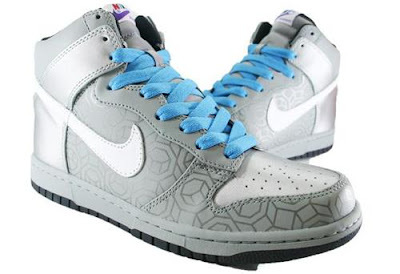 They also sport a black outsole along with light blue laces. They are now available at select Nike retailers and retail for £55.